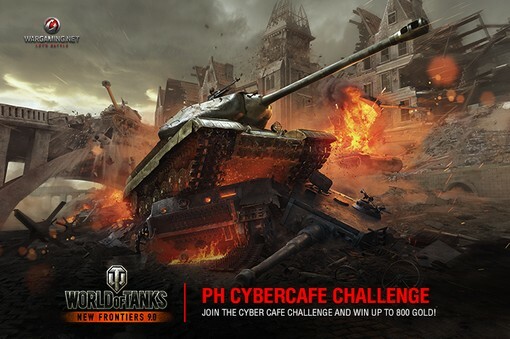 The Cybercafe Challenge this weekend will be held at 2 cafes in the Phillipines! Everyone with tanks tier 5 and above are welcome to join in! Call your buddies along too, because platooning will increase your chances of downing 4 enemy tanks and winning 800! [PH] 26 Jul 2014 Cybercafe FREE PLAY & Challenge! Destroy 4 tanks in a single battle to earn 800! All participants must register on-site during the event. Players must have at least one Tier 5 tank in order to join. Only one account can be used at the event per player (AKA their own personal account). Player may continue their Free Play session after 1 hour if there are no players in the waiting line. Players who have registered for the FREE PLAY event are forbidden to play any other game titles except ‘World of Tanks’ (Asia Server). Each participant can only complete the challenge once for the entire duration of the event. Players are only allowed to join the challenge once. Players are allowed a maximum of 1 hour to complete the challenge. Players who have managed to destroy 4 different tanks in a single battle will receive 800 gold. Once a player completes a challenge, they must call for an Event Marshall or WG Staff to verify their results. Upon completion of the challenge, players will be requested to vacate their seats to accommodate other players looking to participate. If the challenge is successfully completed, gold prizes will be credited to the player's account within 7 days.